The Winchester haunted house is considered to be one of the most popular real haunted places in America. This particular home is literally a maze of beautifully detailed craftsmanship using the Victorian architecture scheme. 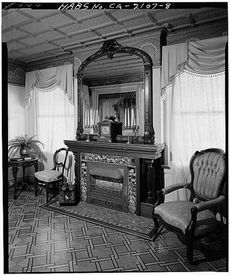 Mrs. Sarah Winchester was a very rich individual. During her lifetime, many rumors circulated that pertained to her rationalization of creating the mystery house. It is believed that these rumors are what actually drove her to live a life of isolation within the eccentric structure. Locally, many individuals referred to this home as the “Spirit House”. In this guide on real haunted places in America, you will learn about the tales and tragedies of the Winchester haunted house. Sarah Winchester was born around the year of 1840. Her birth name was Sarah Lockwood Pardee. She was born in a city called New Haven, which is located in Connecticut. Being born to a prominent family, she was called the “Belle of New Haven”. Sarah was academically inclined and had numerous talents. She enjoyed playing the piano and could play beautifully. In addition to this, she learned to speak a total of four different languages. By the time the year 1862 came around, Sarah met the man that would soon be her husband. His name was William Wirt Winchester. This man was the son of the famous Oliver Fisher Winchester. Oliver was in a major political position in Connecticut and was the head over the manufacturing for the repeating rifle known as the “Winchester”. Sarah and her husband were a very happy couple. Once they married, they had a daughter by the name of Annie. In the year of 1866, the child died and brought a tremendous sadness to the lives of Sarah and William Winchester. Naturally, Sarah became tremendously overwhelmed with depression at the death of her daughter. To make matters worse, in the year of 1881 – just fifteen short years later – William died as well. He added the condition known as tuberculosis. At this point, Sarah was beyond depression. She was extremely devastated. She now lost the whole family that she cared so deeply for. She could not understand how such tragedy could affect her or why it had affected her. As a result, she sought assistance from a well-known medium. When evaluating the real haunted places in America, it is believed that the stories of the Winchester haunted house all go back to the medium that Sarah Winchester consulted with from Boston. This individual that claimed to have medium abilities told Sarah that she was being haunted by people that had been murdered by the Winchester rifle that she and her husband’s family had sold. The spirits that were believed to be haunting her were supposedly those of American based Indians and even soldiers from the Civil War. It was expressed that she was under a type of curse from these spirits and that the hauntings were responsible for the untimely death of her child as well as the death of her husband. The medium then expressed the fact that the spirits would result in Sarah’s death as well. She gave Sarah some advice that she would hold on to the rest of her life. She was told that if she constructed a home for the spirits that it would make them happy. She was told that the home should be built in the west. She told her that if the house was always being constructed in one way or another, she would not have to worry about experiencing her own untimely death. She basically informed her that this home could be the secret to a life that was eternal. By the time 1884 rolled around, Sarah Winchester purchased a plot of land where a farm house stood that needed to be finished near San Jose. This would become the Winchester haunted house. The Winchester haunted house is the most mysterious of all architectural constructions throughout the history of the world. There are many oddities contained within the home. Individuals that visit the structure are warned against wandering alone. This is because of the fact that it is such a maze and so large that it is easy to become lost. One of particular interest is known as the Switchback Staircase. Each step is two inches in height, but the staircase as a whole is seven flights. It has a total of forty four uniquely designed steps that take up a total of nine feet. The building lay out was designed so that it would protect Sarah from the ghosts that she was building the house for. Staircases that lead to nowhere, windows in unusual locations, doors that open into nothingness and several trick routes were built into this home. Construction started in the early year of 1884. In the year of 1922, the construction came to a halt. This was due to the fact that Sarah Winchester finally died. It is rumored that there are several ghosts that reside in the Winchester haunted house. This is, perhaps, why it is considered to be one of the most popular real haunted places in America. It is believed that many of the spirits of those that were murdered by a Winchester rifle haunt the mysterious rooms, stairs to nowhere, and odd secret locations within the structure. 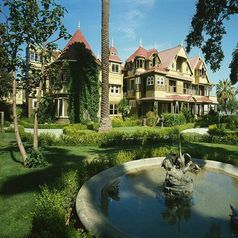 Many individuals even believe that the spirit of Sarah Winchester haunts the structure. If this was truly built for spirits, it is a playground for paranormal investigators and other individuals that are interested in the world’s greatest unsolved mysteries. If you want to experience the grief and triumph of the life of Sarah Winchester and possibly come in contact with one of the spirits that she worked so hard to keep happy, the Winchester haunted house is the place to go. Get the directions, view photos, and read the reviews and traveler tips for the Winchester Mystery House.